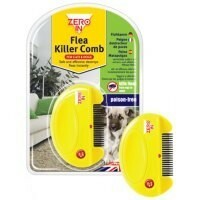 Flea Killer Comb for Cats and Dogs is a safe and effective chemical free way of controlling fleas and ticks on your cat and dog. Delivering a harmless electrical charge to your pet's coat with a simple push of a button, the Flea Killer Comb kills and removes fleas at adult, egg and larva stages. I bought this after reading good reviews - luckily for uss- frontline plus workes so well that I had hardly any fleas to test this on. Hurray. However - i Did zap a few (not sure if flee was stunned or dead) & hence forth presume it workes.